Did I mention in an earlier post that I would definitely try those gizzards at the milk bar? Hell yeah I did. I have to say the taste is not bad and I quite like it. Perhaps one part of the reason is that we eat gizzards a lot in Vietnam too. Like, A LOT. The way we cook gizzards in Vietnam however is different. We love the chewy and crunchy texture while the Polish braises everything to tenderness. I've never had gizzards that tender before, with peppery mushroom sauce and some good old boiled potatoes. Not a bad everyday dish for sure. I also asked for Borscht this time but only got a glass of something that tasted like pickled beetroot juice. Apparently, my taste for Polish food has not been fully acquired. Or maybe I'm just unlucky enough to order the wrong kind of Borscht. 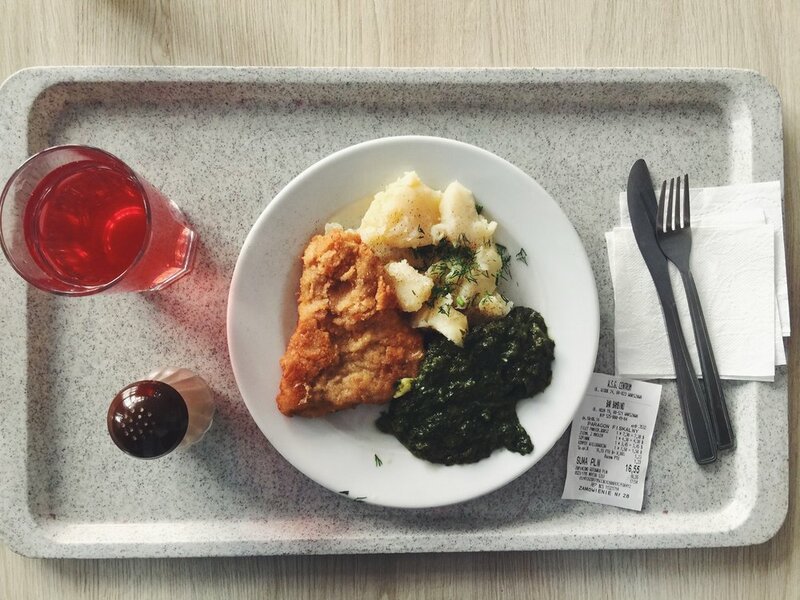 On my last day there, I ordered some good old fried cod and since I wanted something green to go with it, I asked for spinach. Well, it was not the kind of spinach I expected. It looked like a gooey slimy green mess on my plate and I didn't really fancy the taste (which was a weird kind of sweet) either. Somehow, this reminded me of Popeye the sailor man and his canned spinach and got me wonder if he had the same spinach as I did. Perhaps try to avoid ordering this thing at a milk bar guys. Another thing about weird taste, I didn't know Poland was so big on ketchup flavored snacks. Yes, you heard it right, KETCHUP. Is it only me who found it unusual? Every convenience store that I went to dedicated a big part of the snack section for those with ketchup flavor. They didn't look so tempting to me, but I had to try! The verdict? Definitely not a fan. Too bad, sweet and sour ketchupy snacks do not work with me. Still, try it if you can. Maybe it is just me who doesn't like ketchup in general. And guess what? They even have PIZZA flavor! Yes please! 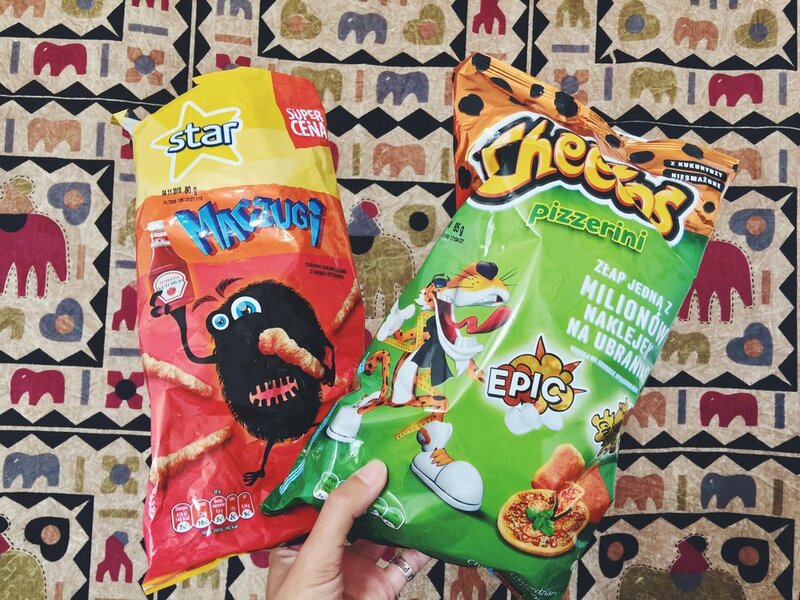 I looooove pizza and now there's pizza snack? Hell yeah I dig this stuff! Now I just realize that I spend the whole post listing weird food stuff I found in Warsaw during that trip. Polish people please don't hate me. I'm just really new to those things, that's all. And now that I'm back in Sweden again, and the normal summer here is back again (meaning cloudy and windy and potential heavy rain most of the time), I can't help but missing the good sunny days in Warsaw. I also miss the feeling of staying in an old communist building in the center of the city. There is something so charming about old communist architecture, at least for me. It's the kind of jolie laide charm, I could absolutely hate it but then I could absolutely adore it too. Or maybe the fact that it is full of history sounds attractive to me. Maybe that's why I find Warsaw and Berlin so adorable while most people don't in terms of architecture. I snapped this picture when I was in Warsaw this June from the window of my room. Somehow the view gave me the feeling like I was living in an anime. The lovely Warsaw let me live that fantasy for a few nights.